by Siân Jones, Hannah Cobb, Ruth Colton and Melanie Giles. Whitworth Park was opened in 1890 towards the tail end of the most prolific park building period the country has ever known. It cost £69,000, and was filled with features designed for the recreation and health of the surrounding neighbourhood. 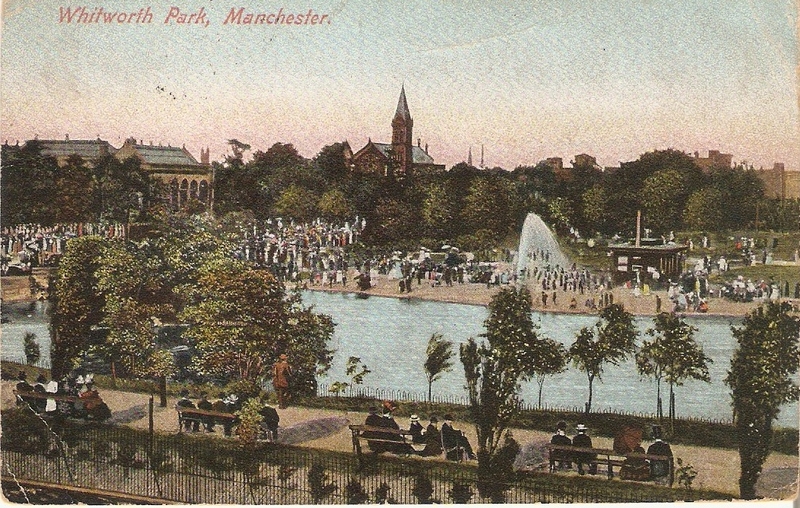 The park became extremely popular on its opening, ‘abundantly visited’ by the local population (Manchester Courier, 5th July, 1890), with some ‘six to eight thousand’ people present on a Sunday afternoon in April 1893 (Manchester Courier, 15th April, 1893). In its Victorian and Edwardian hey-day, Whitworth Park boasted many typical features, such as a bandstand, a large boating lake, an observatory, various shelters, extensive formal flowerbeds, statues, and a covered walkway. However, many of these were removed in the post-war period; a common fate reflecting changes in urban park management and funding cuts. The origins of public parks like Whitworth lie in the nineteenth century park movement, which was a response to the immense changes associated with industrialisation and urbanisation. Parks were designed to address many of the problems with this new urban environment, by providing access to nature, healthy pursuits, clean air, beauty and a sober venue for recreation (Conroy 1991). Indeed the public park was seen as a panacea to the ills of the urban condition and in its idealised form it embodied many of the social concerns of the Victorian period. As a specific kind of urban space, parks embodied a number of philanthropic and ‘improving’ ideals, as well as providing an arena for social control and the inculcation of middle class values (Wyborn 1994). Once part of the urban landscape, they quickly became sites of social encounter, tension and exclusion through which class, gender, civic, national and imperial identities were negotiated (Brück 2013). And despite significant changes, they remain important sites for the negotiation of memory, identity and place, as well as a focus for ideas associated with health, improved air quality, and other environmental concerns. 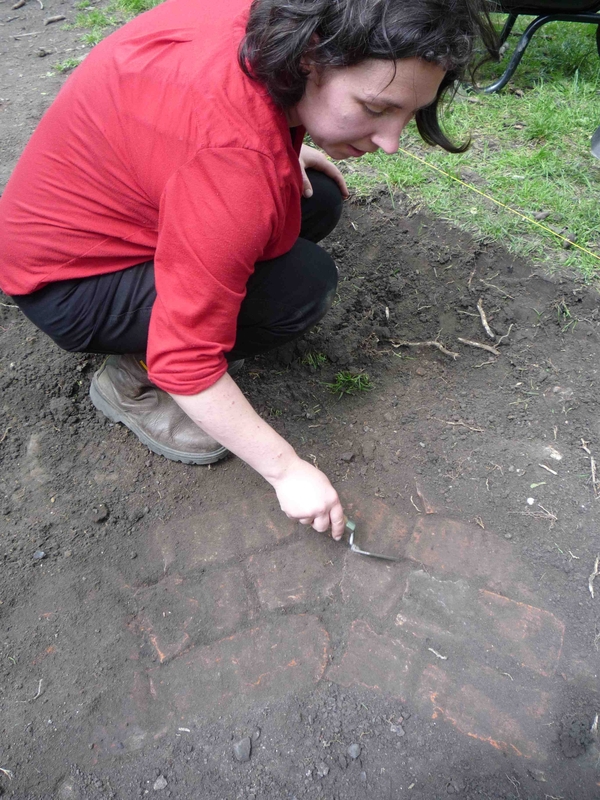 The Whitworth Park Community Archaeology and History Project aims to investigate the long-term social, material and natural histories of the park alongside its changing meaning for local communities. It also aims to use archaeology as a way of engaging contemporary residents with their heritage and to increase the social value of the Park. The project involves archival research, a small-scale oral history programme, and two seasons of excavation, with a wide-ranging volunteer programme and a series of school workshops. There are also public outreach events during the excavation seasons, and other forms of engagement such as newspaper articles, public talks and a project blog. Towards the end of the project we will produce a public leaflet about the Park’s history, a new display board in the Park, and a temporary exhibition in Manchester Museum. The success of the project depends on a number of partnerships. It is led by the Archaeology Department at the University of Manchester and involves postgraduate and undergraduate students as well as academic staff. We hope to connect University-led research with the future of the local community: breaking down the barriers of ‘us’ and ‘them’, to link the hopes and aspirations of local people with those of the University. Our main community partner is the Friends of Whitworth Park, a group formed in 2005, with the aim of promoting the revival of the park for the benefit of the public, especially children, as well as updating ‘the historical infrastructure to make it relevant to contemporary life within a multicultural city’ (Shone 2005). Our other project partners, the Manchester Museum, the Whitworth Art Gallery and the Ahmed Iqbal Ullah Race Relations Resource Centre have forms of expertise and skill that support the public and school components, as well as established community relationships that we can draw on. A close relationship with Manchester City Council is also a key component both in terms of providing resources, and facilitating and promoting our work in the Park. The excavations provide a remarkable catalyst, drawing the interest of park users. The physical remains of former park features such as the lake and the bandstand stimulate people’s imaginations and memories. 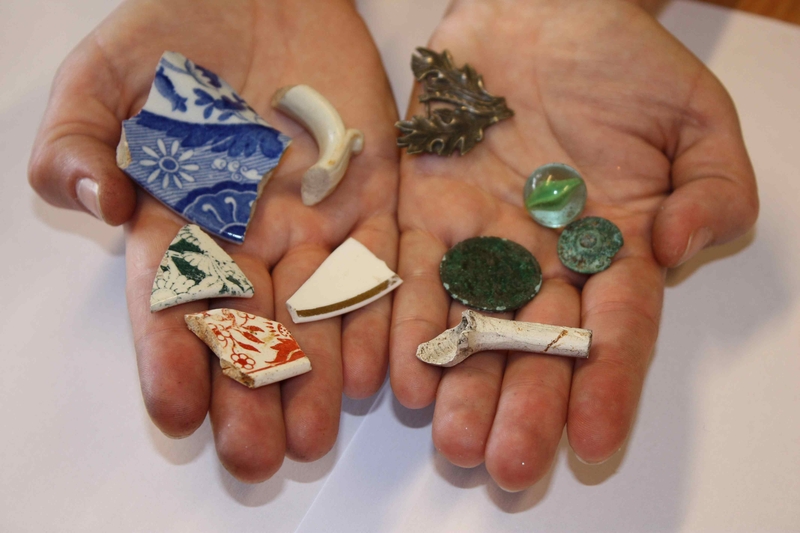 Objects like marbles and other children’s gaming pieces, the remains of clay pipes, items of personal attire, like jewellery and buttons, all offer a powerful means of engagement. 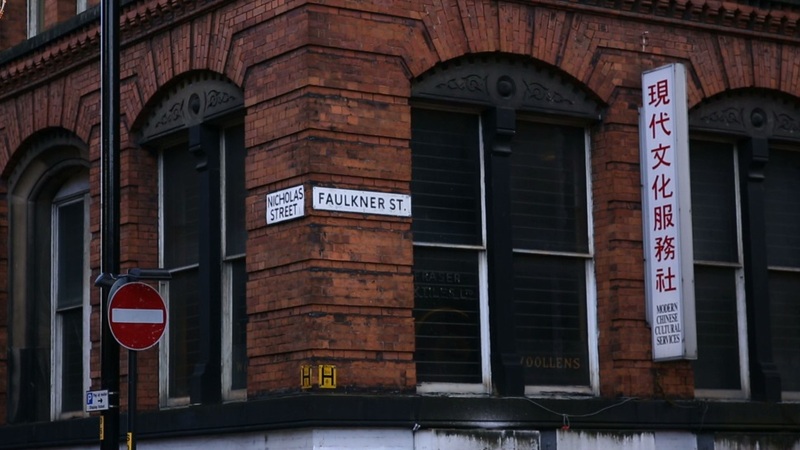 They connect people viscerally and emotively to the lives of previous generations of Mancunians and tell us about the unspoken aspects of daily life: the unwritten history of working and middle class lives. This gets to the heart of why the project provides such a rich context for combining research and community engagement. It also underlines why participation in the process of investigating Whitworth Park’s past creates enormous social value in the present. By exploring the park’s past, we hope to raise aspirations for its future, and to engage people in caring for their urban green spaces. 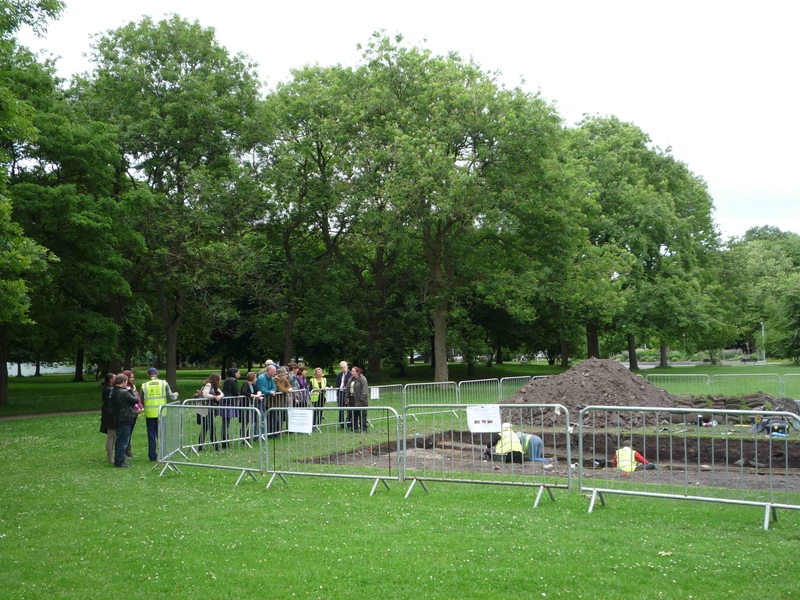 The second season of excavation will take place 1st – 12th July 2013, Whitworth Park. There will be an Open Day on 6th July in Whitworth Park. 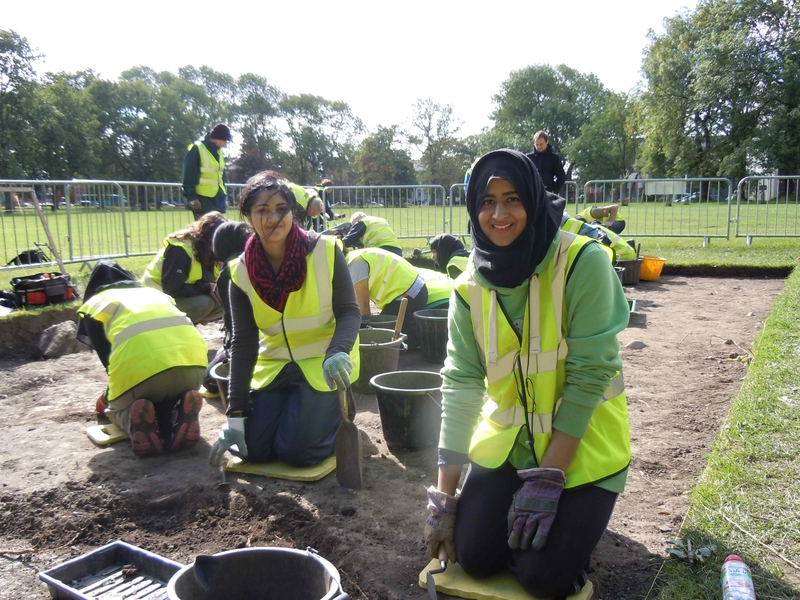 The Whitworth Park Community Archaeology and History Project is funded by a grant from the Heritage Lottery Fund, with additional funding from the University of Manchester and Manchester City Council. 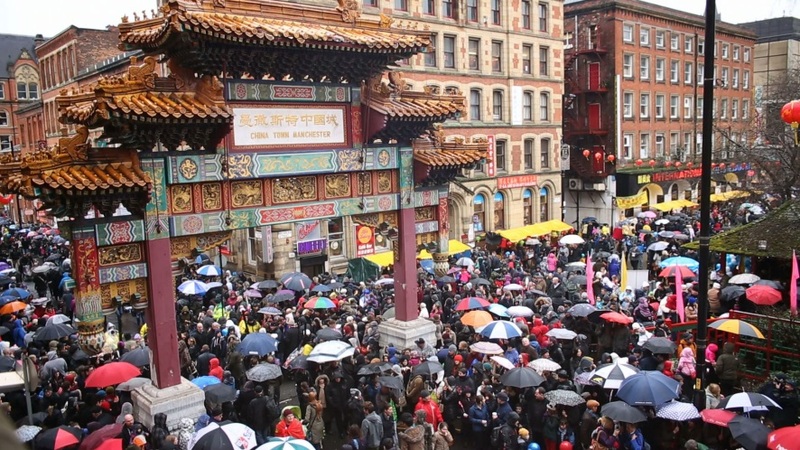 The Project is led by the Department of Archaeology at the University of Manchester, in association with the Friends of Whitworth Park, Manchester Museum, the Whitworth Art Gallery, and Ahmed Iqbal Ullah Race Relations Centre. All of these organizations have committed considerable resources to the project. We would like to thank all of the above, alongside our volunteers, students and project staff for making the project a success. Finally, we would like to thank the residents of Manchester who have engaged with the project and shared their memories and aspirations with us. Brück, J. 2013. Landscapes of desire: parks, colonialism, and identity in Victorian and Edwardian Ireland. International Journal of Historical Archaeology 17(1): 196-223. Conroy, H. 1991. People’s Parks: The Design and Development of Victorian Parks in Britain. Cambridge: Cambridge University Press. Shone, K. 2005. Whitworth Park Future Planning Document. Wyborn, T. 1994. Parks for the People: the development of public parks in Manchester, c1830-1860. Manchester: University of Manchester. The Rambler in Manchester. Manchester Courier, 15th April, 1893. Trees and Shrubs for Town Planting. Manchester Courier, 5th July, 1890. This entry was posted in Interventions and tagged Archaeology, Built Environment, history, Manchester, Public Space on July 8, 2013 by citiesmcr. 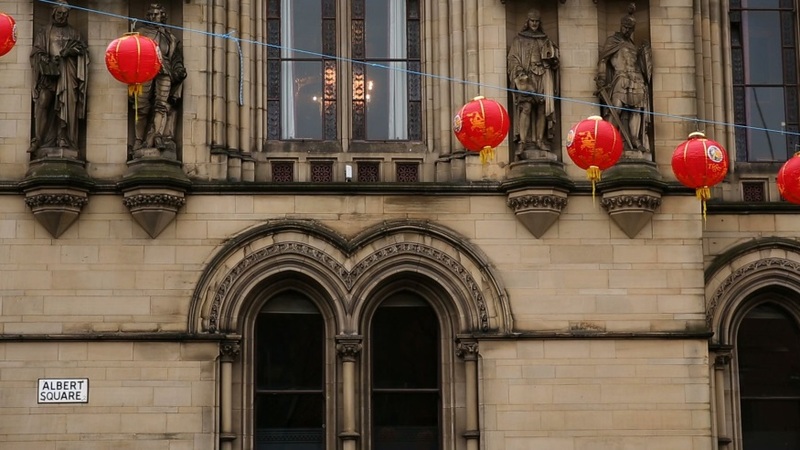 On the 8th May we organised a successful one-day symposium examining urban change in post-war Manchester, focussed upon infrastructural projects and the local implementation of central government initiatives in the three decades following 1945. 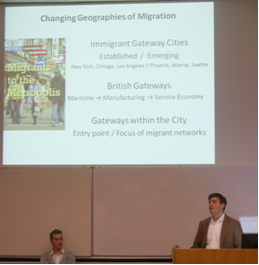 Over one hundred people attended the event and engaged with a fascinating set of presentations from a range of geographers, historians, planners, architects and archaeologists composed of a mixture of well known professors, established scholars and new researchers. Fittingly for the symposium’s temporal focus it was held in the concrete bunker formerly known as the Kantorowich Building, designed by Professors Roy Kantorowich and Norman Hanson and completed in 1970. 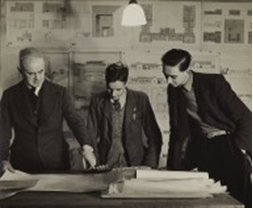 The speakers presented in the Cordingley Lecture Theatre, named after Reginald Cordingley (shown in full instructive mode below), Professor of Architecture at the University of Manchester between 1933 and 1962. Aim: What changed in Manchester and what drove the changes? The presentations were intended to reference transformative events and large scale built projects of the era in relation to civic plans, infrastructural initiatives, local and national government policies, technological innovation and the wider fiscal climate. The intellectual objective of the symposium programme was to reveal a selection of the significant narratives of the shifting social and physical development of the city during the years 1945 – 1974. Whilst we recognise that the two dates are, in many respects, arbitrary bookends for processes of change and urban development that are often long running and cumulative, they do provide a set of sensible marker posts – running from the end of the Second World War in 1945 up to 1974 and the wholesale political reorganisation of the conurbation in the wake of the Local Government Act (1972). As a departure point, 1945 is particularly interesting and equally problematic, as it is all too easy to assume it as a pivotal moment, when, in actuality, it simply marked the end of the wartime hiatus and the resumption of many schemes and strategies devised in the decades before 1939. 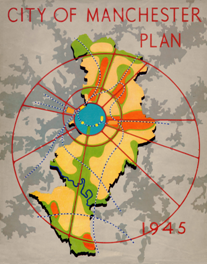 That said, many of the speakers made explicit reference to Rowland Nicholas’ 1945 City of Manchester Plan as a signature ‘visionary’ document of the era and it is evidently a useful narrative touchstone. It is perhaps unsurprising that the other end of these three decades was less considered. 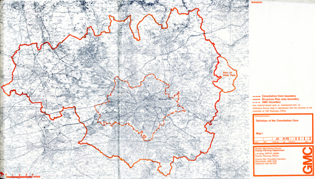 There were markedly fewer references to the formation of Greater Manchester, possibly reflective of its ambiguous status at the time and its limited legacy in the makeup of contemporary Manchester. It is now an apposite time to consider this period, via a public symposium, for several reasons, not least of all because some of the personnel directly involved in the projects are still around and can be ‘brought out of the woodwork’ to tell their stories. Moreover, primary documentary material is newly emerging into archives and becoming publicly available, and more generally it taps into growing scholarly engagement and broader public fascination with these three decades not just in this city, but across Europe. This symposium built directly on our experience of curating a successful public exhibition in spring 2012, entitled Infra_MANC, that considered the role of infrastructure in the making of post-war cities by looking at the planning of the Mancunian Way elevated urban motorway, the never realised Picc-Vic railway tunnel, the Guardian ‘secret’ underground telephone exchange and fanciful notions for a rooftop city centre heliport. The 200 page illustrated catalogue from this exhibition has just been released online as free PDF book. The study of both built and unbuilt projects has the capacity to reveal new histories, particularly political relationships and the interplay of local interests with national policy directives. Unrealised urban schemes, be they for buildings or infrastructure, frequently leave unrefined traces of their gestation, promotion and failure that do not gloss over the fractious and antagonistic relations of policy makers and power players. In this regard the active debates and discourse around the things that did not physically alter, but still had the capacity to change, the city were as relevant to the symposium as the obvious large scale extant developments, which were also considered. The event itself was arranged into four sessions. It began with a contextual overview, eloquently chaired by Professor Brian Robson and in the opening talk by Professor Michael Hebbert, a former professor at Manchester, dissected the limits of the assigned time frame and provided passionate prose on the relative shift from the modern industrial metropolis to a something approaching a post-modern service city and its refraction through the lens of Granada Television’s Coronation Street. Subsequent sessions dealt with spatial changes related to housing renewal, the development of key social institutions including higher education and the NHS, and the impact of pollution control on the environmental quality for the city and its citizens. Midway through the day a stimulating presentation was given on population migration in the post-war period contrasting the situation in Moss Side to Cheetham Hill, presented by University of Manchester colleagues Laurence Brown from History and Niall Cunningham based in the ESRC Centre for Research on Socio-Cultural Change (CRESC) (shown in the photograph above). The day concluded with presentations on the development of aviation facilities for Manchester, the broader culture of the Mancunian Way and a description of the ‘disconnected city’ caused by distinct shadow of unbuilt ring roads in the urban form of the city centre. Each participant received a 36 page printed booklet containing the full programme and speaker details. 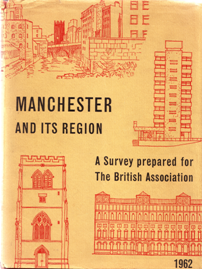 The symposium also included a gallery of reproductions of nearly twenty of the key plans and maps from the era and the Manchester Modernist Society were on hand with their ‘pop-up shop’. The full programme and abstract of the presentations are given on the supporting blog, PostwarMcr. With the kind permission of the speakers we have been able to provide copies of the slides for the majority of the talks, which are also available via the blog. The symposium was made possible with financial support via a Seedcorn grant from the Cities@Manchester initiative and with complementary fund through the Campion Fund of the Manchester Statistical Society. Behind the scenes logistical support was provided by colleagues in SED and several student volunteers from architecture and geography. The Manchester School of Architecture kindly underwrote printing costs. We plan to develop an edited book following the themes of the symposium and we are pleased that many of the speakers have committed to contributing chapters. In broad terms the volume will be a compendium of new and existing works and organised in the manner of a ‘regional study’ with chapters covering key themes (housing, transport, education, industrial change, etc.). As such, the book will have clear resonances with earlier edited volumes, such as the survey prepared under the editorship of Charles Carter for the meeting British Association for the Advancement of Science held in Manchester, August 29 to September 5, 1962. 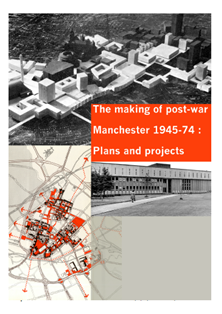 As currently proposed, our new title, The Making of Post-war Manchester will, hopefully, be much broader in style and with discursive space for commentaries, shorter essays and visual interpretations of how city changed during the thirty or so years after the end of the Second World War. It is likely that it will be published and distributed by bauprint, Richard’s cottage publishing arm, designed and priced to appeal to wide readership interested in the city’s histories. Once the initial print run is sold we will also make the book available free online as a popular and educative resource. The Making of Post-war Manchester symposium brought together scholars from a range of disciplines and professionals in planning and architecture, along with students studying aspects of Manchester’s development, and some members of the general public, interested in the recent history of their city. It is hoped that the crossing of disciplines will provide new narrative associations previously unexplored that may act as a platform for further research and discourse. This entry was posted in Interventions and tagged Built Environment, Culture, Design, Development, history, Manchester, Planning, Public Space on June 4, 2013 by citiesmcr. The heavily contested decision to remove part of the longest remaining stretch of Berlin Wall to make way for luxury new flats has led to the re-emergence of some of the key issues that have characterised post-unification urban planning in Berlin: gentrification; the treatment of historical traces; and the significance of interim spaces. Underlying these is the confrontation between a market-driven, neo-liberal socio-economic structure and a rejection of that as a dominant framework which should shape the urban environment of Berlin. At the time of writing, the East Side Gallery has been granted a stay of execution but this is far from the only arena in Berlin where these debates play out: just over five kilometres away the airfield of the former Flughafen Tempelhof is subject to a redevelopment plan which has pitted individuals, citizens’ groups, and some politicians against the Berlin Senate. The site itself is of great architectural and historical importance: The airfield is a key site in aviation history having hosted pioneering flight demonstrations in the early twentieth century; Sagebiel’s colossal airport building, begun in 1937 and never fully realised, was one of the prestige projects of the Third Reich. A hybrid between stone-clad National Socialist monumentality and a technically innovative 1930s city airport, it remains one of the most iconic buildings in Berlin; the use of the airport by the American Air Force after the war, and in particular, its connection with the Air Lift have re-inscribed the site as a ‘symbol of freedom’ to many (West) Berliners; and the controversial cessation of flight operations in 2008 brought the site’s future firmly into public discourse. When the airport closed, a unique asset was brought back into public use: a 270 hectare area of open space. Its use as a military exercise and parade ground and then as an airfield had preserved the vast green area and enabled it to leap-frog almost two centuries of ideas about how public space should be constituted. It has now, however, been exposed to the forces acting on the 21st century Western European city. In 2010 the airfield was opened as a unique city park, enabling visitors to cycle and skate on the former runways and to play sport and picnic underneath now defunct signs displaying instructions to pilots. Citizens were invited to apply for space to establish interim ‘pioneer’ projects which currently range from a unicycle school to allotment-type ‘urban gardening’ facilities for residents without access to a garden. On 6th March 2013 the ‘masterplan’ for the future of the site was unveiled at a lively public meeting in the former airport building. The plans confirmed the intention to ‘develop’ the former airfield in two senses of the word: to build new ‘city quarters’ on the field’s edges; and to alter its internal structure. 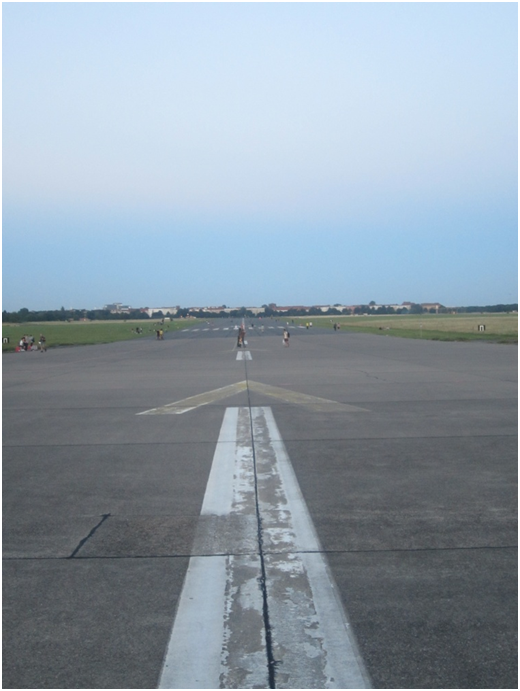 The Senate for Urban Development states that they are meeting demands for increased housing in Berlin and for improved facilities at the park yet both elements of this reconfiguration of Tempelhofer Feld are being met with resistance. 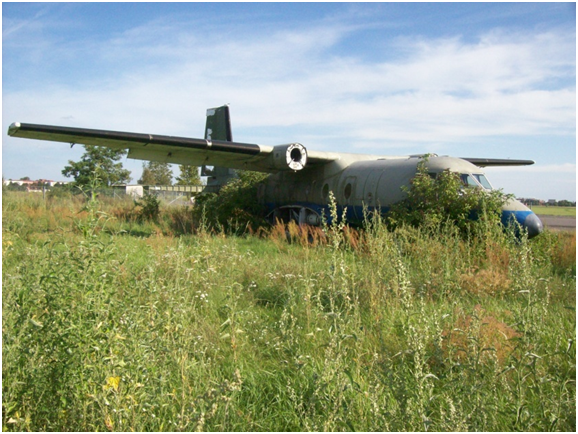 Citizens’ initiatives such as 100% Tempelhofer Feld are leading the campaign against the proposal to build on the former airfield. They have organised a petition for a referendum which will reach the second round in September. Green and Left Party politicians have submitted a motion to the Abgeordenethaus for a halt to the planning process while this petition is still running . The reaction is not only against the proposal to build on the site but also about the plan to reshape the 230 hectares that will remain as parkland. The 2013 ‘masterplan’ makes clear that the next few years will see increased intervention into the remaining park landscape. The proposed system of pathways will shape how visitors use and experience the space, creating easily accessible areas which will be more intensively used than the expanse in the middle where there will be fewer paths. The 4 hectare water basin, which will collect rainwater from the building, will constitute the first major permanent feature on the landscape which does not attest to its history or former function. The 1000 trees, which are to be planted at the site’s edges to provide shade and seem to be positioned to serve a double function in screening the proposed new city quarters, will bring about a contraction of the site’s perimeter, diminishing the vast emptiness of the Feld’s panorama. Those campaigning for Tempelhofer Feld to remain in its present condition fear the transformation of ‘anti-park’ into ‘designer park’. The designation of ‘anti-park’ derives from the fact that, as an appropriation of left-over space, Tempelhofer Freheit, as the park is named, is not the product of an over-arching ‘park design’ process. Accordingly, several of the features that characterise the western public park are absent here. In contrast to the taming of nature prized in the gardens of the baroque or renaissance period, the park at Tempelhof has been characterised by the celebration of the capacity of nature to reclaim and reassert itself. Unlike the pathways of the nineteenth century park, with their graceful contours and simple variety which Joyce explains were carefully designed to encourage walking in the belief the working class would seek to emulate the comportment of their ‘betters’, the default means of getting around Tempelhof are the former runways, shaped to fulfil an entirely different function. Similarly, while Joyce explains that a key feature in the design of nineteenth century public park was the variation of the (in)finitude of space, achieved through the strategic planting of trees to open and close the panorama, Tempelhof is characterised by the vast emptiness of its horizon. In other ways, however, the ordering processes that Joyce identified in the nineteenth-century public park have been active at Tempelhofer Freiheit since its opening. There is, of course, considerable relaxation in the idea of what is ‘appropriate’ for a public park – ‘swearing’ and ‘dirty clothes’ are not banned, for example, yet the restriction of loose dogs and barbecuing to designated areas, unusual in Berlin, raised eyebrows. More pronounced is the issue of (in)accessibility that arose when it became clear that the park would have a perimeter fence with opening and closing hours; ‘a people’s park –until the sun goes down’ wrote one newspaper. The rejection of the idea that through the numbered gates and the non-porous boundaries of Tempelhof, the park and its visitors become countable, knowable and therefore manageable feeds into a wider theme which is particularly salient in 21st century Berlin; resistance to the homogenisation both of space and of the individuals that inhabit that space. Through the fence, Tempelhofer Feld is demarcated as a ‘place’ wherein particular norms of behaviour are expected and, to an extent, enforced. This is consolidated by the fact that the public can only use the park during daylight hours, i.e. when they are visible, this suggests that when they cannot be seen, and thus monitored, the ‘general public’ may not conduct themselves ‘appropriately’ and should thus not be permitted to access the park. 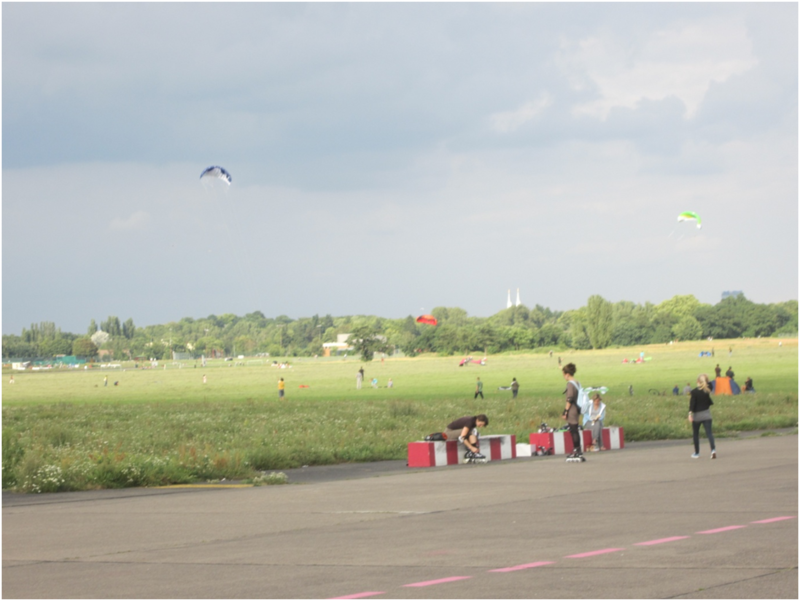 Tempelhofer Feld is seen as a tranche of wilderness which through historical circumstance has persisted within the urban area. The proposed development is seen as an extension of attempts to manage its wilderness, to limit access to it, to shape how it is to be used and experienced and, most significantly, to repackage parts of it as a commodity. Joyce, P. 2003. The Rule of Freedom: Liberalism and the Modern City. Verso: London. Pp 222-224. This entry was posted in Interventions and tagged Architecture, Berlin, Design, Germany, history, Planning, Public Space on May 7, 2013 by citiesmcr. Dickens knew all about small memories. I recently came across this quote from the final chapter of The Old Curiosity Shop. Kit takes his children to the site of Little Nell’s house, demolished in the slum clearances of the mid 19th century. The house is gone, but he has the need to locate, not just remember it. Placing the memory gives it substance, and he wants to pass on the whole memory, not just the story. I recognize this from my own history. Whenever our family travelled along the M6 to Birmingham, my mum would point out Frankley Service Station and tell us about her grandfather who worked for the water company and lived in a tied cottage at Frankley Beeches. The memory was only ever recalled and retold in its proper place. 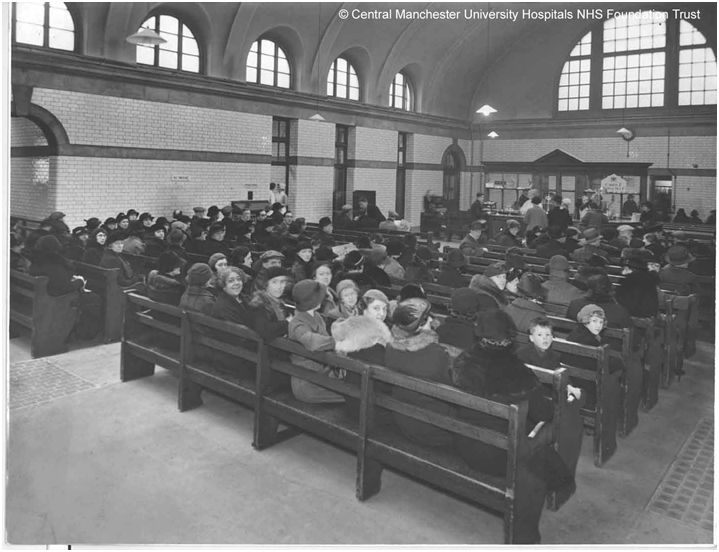 In my research I take people to the remaining parts of the original 1908 hospital site, and show them photographs of places which have now been demolished. These actual places and photographic representations of place elicit not only rehearsed memories about the site like my mother’s story about Frankley Beeches, but other memories, forgotten in the interim, which are discovered as if they had been left in the place, rather than carried in the mind of the interviewee. I interviewed a retired nurse who trained at the hospital and went on to have an extraordinary career, nursing in ward zones across the world. Nevertheless, visiting the site triggered a small memory, more than 50 years old, of looking through the hospital railings and seeing policemen arresting prostitutes working on the other side of the road. The ‘new’ memories that my interviewees discover are triggered by particular places but when the places are gone, and there are only photographs to rely on, the possibility of unrehearsed memory is limited, whereas every stone, every view, smell, light condition, sound of the original building, could have been the trigger for some new memory. The loss of place leads to the loss of memories and weakens the sense of belonging, of being connected to a wider community. Dickens suggests that when place changes, it leads to confusion. Certainly, people who suffer from memory impairment are often confused and distressed by being moved away from their familiar environment. Even a new kitchen or redecorated room can dislocate them from the past memory that they use to guide them in the present. When I interviewed a psychiatric nurse whose association with the hospital stretched back almost 30 years he confidently showed me the place where the old unit used to be, where they used to play football with patients, where the patients used to run a car-wash as part of their therapy. But later we met his colleague who identified completely different locations for the same sites. Visiting the post graduate training centre, the receptionist knew that round the corner, you could see the façade of the old Outpatients Department, but had no idea that the new entrance where she was sitting was built on the side of that very same building and that the lecture rooms she directed students to, were where people queued for treatment. 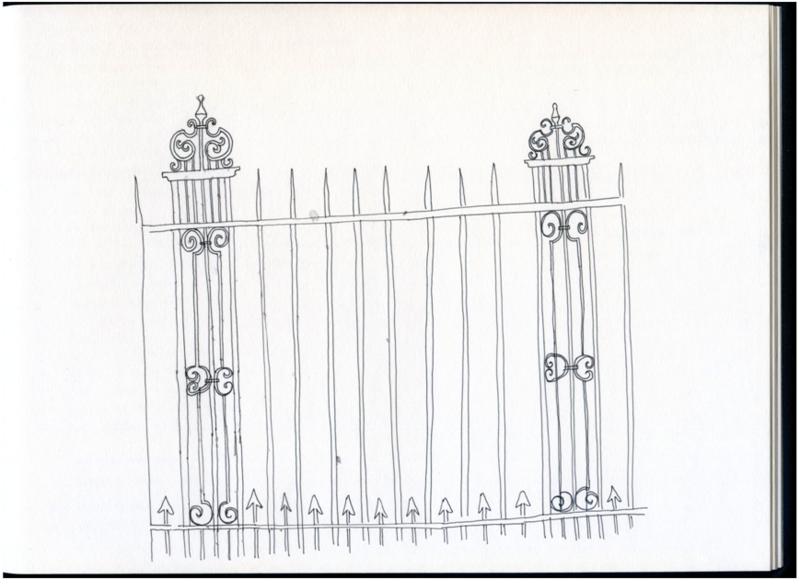 Returning to Dickens’ novel, Kit not only needs to find the exact place where the house stood, but he attempts to memorialize it by marking out its shape. The urge to describe memory by some physical manifestation in place is also a common experience. For example, people are drawn to leave flowers at an accident site – sometimes with a photograph or a poem. This same impulse inspires me to create work that memorializes lost sites. In my artwork, I, like Kit, am attempting to draw ‘a square upon the ground’, and in the process, I am insisting on the value of small memories, and their importance to people and to society. For more examples of Annie Harrison’s art work, see her website: www.annieharrison.co.uk. Connerton, P. (2009) How modernity forgets. Cambridge: Cambridge University Press. Rogers, J. (Writer) (2009). The London Perambulator. London. This entry was posted in Interventions and tagged Architecture, Arts, Built Environment, Health, history, Manchester, Memory on May 21, 2012 by citiesmcr. Guest post by Kenn Taylor. With the recent campaigns to save Preston’s Bus Station, Birmingham’s Central Library and Portsmouth’s Tricorn Shopping Centre. Not to mention the emergence of Manchester’s The Modernist magazine, books like Owen Hatherley’s Militant Modernism and critic Jonathan Glancey’s numerous broadsheet eulogies, it seems that we are now going through a period of revisionism in relationship to the Modernist architecture of the 1960s and 70s. That which was reviled by so many for so long is now being venerated. It many respects this is inevitable. In the cycles of something changing from ‘old fashioned’ to ‘classic’ in the public consciousness, 30 or 40 years usually about does it. It’s also about time. This period of architecture produced many fine buildings of international importance in Britain’s towns and cities, and too many of these have already been lost to indifference. We must protect the best examples of buildings from whatever era from the mere whims of fashion. How much great Art Deco architecture was destroyed, like the Firestone factory in West London, before we realised its value? Yet, despite the need to acknowledge the importance and value of such buildings, I don’t think we can truly celebrate the best architecture and design of the post-war Modern era without simultaneously acknowledging the failures. This was starkly highlighted to me when I visited an exhibition held at the Liverpool School of Art in 2011 – Design Research Unit 1942-72. You may never have heard of the Design Research Unit (DRU) but you will know its work. Their 1965 British Rail logo is still used on every station in Britain, now no longer the brand of the long defunct British Railways Board, instead a generic symbol for railways, and probably DRU’s most prominent legacy. Their other work was as many and varied as it was influential, as the exhibition displayed. Ranging from the interior of the P&O ocean liner Oriana and sections of the 1951 Festival of Britain, to the ICI logo and the 1968 City of Westminster street signs, which have become as an integral part of London’s streetscape as red buses and black taxis. The DRU was formed in 1943 by the poet and art critic Herbert Read, architect Misha Black and the graphic designer Milner Gray. It was arguably the first multidisciplinary design agency in the UK, working across architecture, products and graphic design. The DRU was a product of the Modernist belief in the power of the new and optimism for the possibilities of the post-war era. Founded to help build anew Britain after the horrors of war and depression, when everyone, designers included, was desperate to break with the past. For me though, the most telling part of the exhibition was that which looked at Milner Gray’s work forLondon’s Watney Mann brewery in the 1950s and 60s. 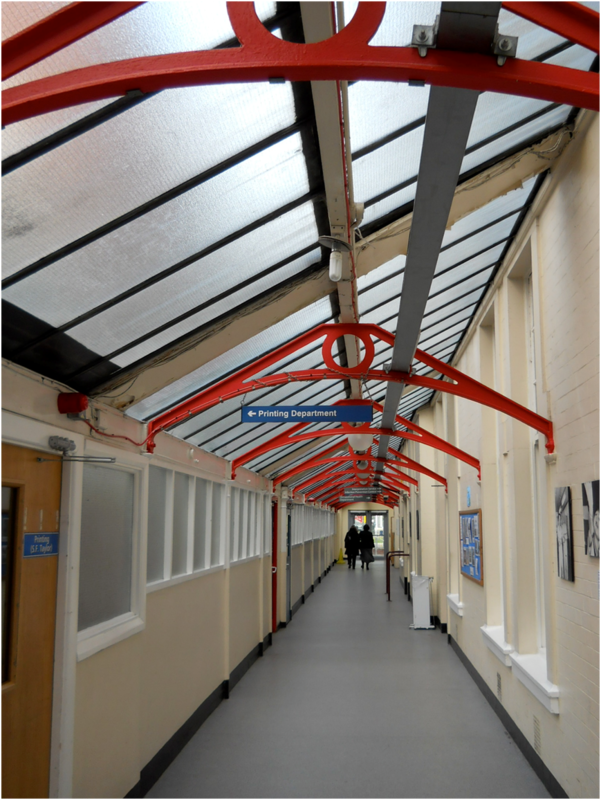 Watneys commissioned DRU to provide a coherent look for its huge range of premises. In response, Gray developed a new identity with five different types of lettering and decoration to be used, depending on the architectural style of each public house. 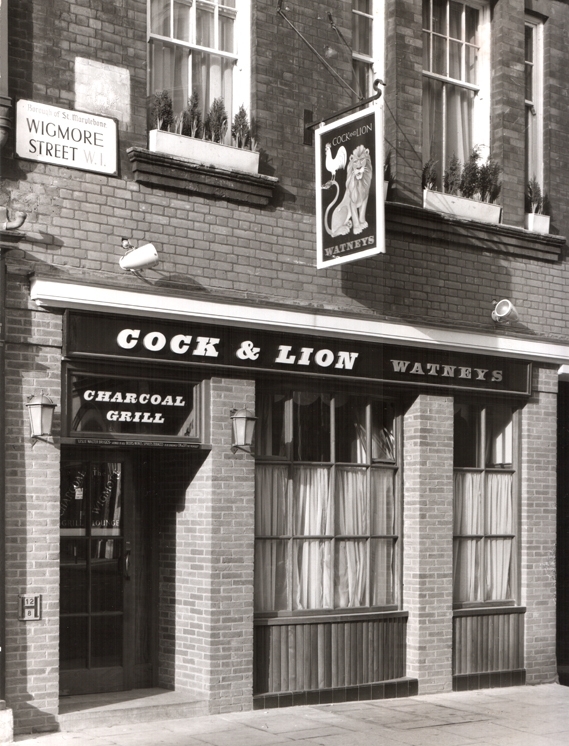 Watneys new signage used a ‘slab serif’ font made in pressure-formed plastic, a style which soon became a high-street craze. Yet, despite its pioneering nature, to me the Watneys project highlights the negative aspect of not only DRU’s work, but the wider failures of Modernist design. After it, many other breweries adopted similar makeover schemes in a period which saw many pubs have their individual characteristics, developed over decades, ripped out in favour of a plasticised standardisation. Designs imposed from on high that reflected little of the culture or history of where they were being dropped in. Looking only modern and fresh for a brief time, before ageing poorly due to changes in fashion and the low quality of the materials they were made of. Watneys thrusting attitude towards modernisation even spread to their beer, with the revulsion against the mass-produced blandness of its Red Barrel ‘modern’ keg beer helping to spark the foundation of the Campaign for Real Ale and its fight for traditional, quality, regional brews. Even looking at the simple brilliance of DRU’s British Rail logo, the over-arching brand identity they developed for the railway often took no account of the great diversity of historic architecture that it was being pasted on. It also reflected the wider ‘modernisation’ of Britain’s railways that saw the destruction in the 1960s of many historic stations, including London Euston, which was replaced with the Modernist mediocrity that greets me on every trip to the capital. Euston’s uninspiring shopping arcade descending into dank concrete platforms stands in negative contrast to the still stunning Victorian glass barrel roofs of Liverpool Lime Streetwhich I meet at the other end of the line. As well as being its strength, Modernist architecture and design’s ubiquity, utopianism, universalism and uniformity were also its undoing. 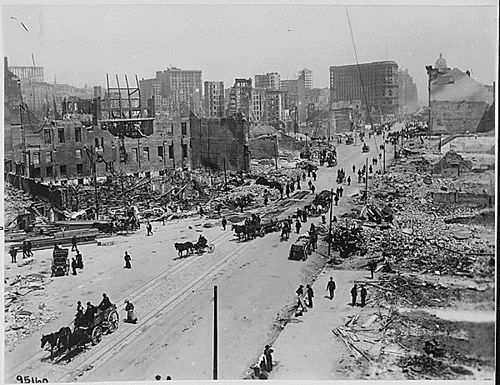 In trying to re-make everything and escape the horrors of recent history, it destroyed not only what was bad of the past, but what was good as well. With a missionary zeal that also saw a huge chunk ofBritain’s Victorian and Georgian architecture demolished, one of the reasons that 60s Modernism is still so despised by so many today. Many of the arguments around supporting such Modernist architecture seem to hang on the idealism and optimism that surrounded such buildings. In contrast to the cynical vapidness and blandness of so much contemporary ‘ laissez-faire’ architecture that is in many cases replacing Brutalist post-war structures. Yet such bland homogenisation is just as resplendent in much of the worst of mediocre Modernism as it is in any contemporary neo-liberal urban development. Neither does such thinking acknowledge the dark arrogance that underpinned the philosophies of Modernist design; that educated elites could engineer the world into a utopia through planning and design. The idea that an internationalist aesthetic could be imposed on a specific culture and that it would ‘improve’ the people living amongst it. Interestingly, this resurgence in the support for Modernist architecture is almost the same as in the 1960s, when civic worthies first really began to fight to save Georgian and Victorian heritage from redevelopment. This was inevitably led by middle class outsiders, whilst many living in such areas were glad to see the back of such buildings, even if they disliked being moved from old neighbourhoods to new estates. So now, while many are now striving to protect Modernist buildings, they are rarely are the ones who have to shop in Portsmouth, get a bus in Preston or borrow a library book in Birmingham. It is precisely this placing of aesthetics and ideas over people and function that caused so much Modernist architecture to fail. I saw this illustrated glaringly in a Guardian article by curator and writer Stephen Bayley, about the attempt to preserve from demolition the Brutalist concrete housing complex, Robin Hood Gardens, in a deprived part of East London: “the unintelligent housing policies of Tower Hamlets populated Robin Hood Gardens with the tenants least likely to be able to make sensible use of the accommodation. 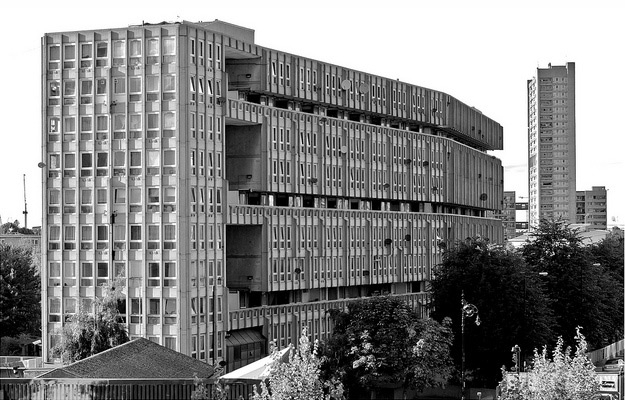 We have to whisper it, but the Unité d’Habitation [Famous Modernist housing block in Marseilles] works because it is populated by teachers, psychologists, doctors, graphic designers, not by single mothers struggling with buggies.” This is a striking example of an aesthete criticising a deprived population for not being appreciative of what they have been ‘given’. Whilst forgetting the very reason such buildings were constructed was to improve living conditions for poor families, something which they have so often resolutely failed to do. Meanwhile, fellow Guardian journalist Simon Jenkins pointed out that nearly 80% of Robin Hood’s residents wanted the estate demolished and rebuilt so they could stay in the neighbourhood and, even more tellingly, that no one on the preservation campaign actually lives there. Its brash, Brutalist structures may look impressive, yet apparently remain not great to live in. We should acknowledge the positives of the Modern era. It pioneered techniques and materials we now take for granted and saw many important buildings and designs produced in what was ahigh pointof British construction and production. Yet we cannot view it through rose-tinted spectacles. The people behind such designs may have truly believed they were making places better for ordinary people, but their bold visions were in many ways also arrogant, and have so often failed. You cannot celebrate the visual power and utopianism of post-war Modernist design without acknowledging how quickly all that decayed and how much that negatively affected many people’s lives. Just as preservationists of the Victorian era who emphasise its pioneering, graceful designs should also acknowledge the poverty, repression and exploitation that marked that era also. Looking back at that Design Research Unit exhibition, its final section was about how the DRU’s headquarters, a standard-looking brick office building in London’s Aybrook Street, were given a radical, brightly-coloured, rooftop extension by the then young architects Renzo Piano and Richard Rogers in 1972. Piano and Rogers of course went on to design the Centre Georges Pompidou in Paris, one of the most influential buildings of the late 20th century and a pioneer of Post-Modern architecture. Today, that dramatic extension of Aybrook Street has been re-covered in something bland and grey, more in keeping with the style of the older building, its Modernist zeal hidden as if in embarrassment. This is a shame, we should not just cover up or destroy this era of architecture, if it is still of use, but when we look at it, not only remember the power and vision of its designs, but also the danger, as ever, of rapid, destructive change, of putting ideas above people, or of believing in grand solutions, imposed from on high, to any problem. We should preserve these buildings to remind us of our past, not just the good, but the bad as well. Kenn Taylor is a Liverpool-based writer and researcher with a particular interest in community, culture and the urban enviroment. This entry was posted in Interventions and tagged Built Environment, Design, history, Housing, Modernism, Planning on May 8, 2012 by citiesmcr.